Japanese style room A (approx. 13m^2~17m^2). All rooms with bath, restroom w/bidet, refrigerator, flat screen TV. The private open-air bath is free for guests. 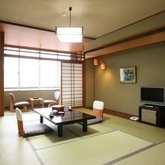 Japanese style room B (approx. 13m^2~17m^2) w/ full bathroom. Japanese style room B (approx. 13m^2~17m^2). Japanese style room C (approx. 13m^2~17m^2) w/ full bathroom. Japanese style room C (approx. 13m^2~17m^2). All rooms with bath, restroom w/bidet, refrigerator, flat screen TV. Japanese style room D (approx. 13m^2~17m^2) w/ full bathroom. Japanese style room D (approx. 13m^2~17m^2). Japanese style room (approx. 13m^2~17m^2) w/ full bathroom. Japanese style room (approx. 13m^2~17m^2).